Casio PCR-272 Electronic Cash Registers at Cash Register Store. Replaced by PCR-T280. Click here for more info. 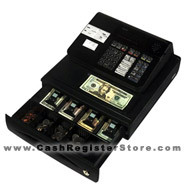 The Casio PCR-272 serves as a lightweight easy to transport simple cash register. If you have a kiosk or perhaps a spot in a farmers market, the PCR-272's small footprint will save you precious space. Basic features include 5 direct department keys and up to 20 departments with shift levels, 120 plu's, 8 clerks, 3 payment media and a media slot in the cash drawer to insert larger bills or checks. 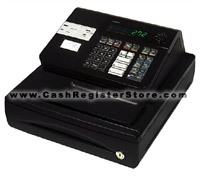 This is our lowest cost cash register! Even at this low price, we still offer FREE lifetime tech support. This is a service that our competitors cannot or do not offer. 5 Department Keys � for quick and easy item transaction entries and categorizing sales. An additional 15 department (max. 20) categories are available through a department shift key to provide more product grouping. 120 Price Look Ups � to provide individual item control. The PLU function is a number assigned to an item that also has a price associated to it providing individual item sales. 8 Clerk Totals � allow you to track sales by eight different operators. Quiet High Speed Drum Printer � to be used as either a customer receipt printer or a journal printer to record all the store�s activity. Mode Lock with Key Control � provides multiple operation positions through a physical keys. Two keys are provided, OP key allows only registration and the PGM key provides access to all positions. 4 Tax Rates � provide multiple taxes to used on calculated on selected keys. Calculation Function � is a mode lock position to provide easy and quick mathematical calculations outside a transaction.